Subject description: Get the latest version here! Update: The alpha version 0.58 is now mentioned above. 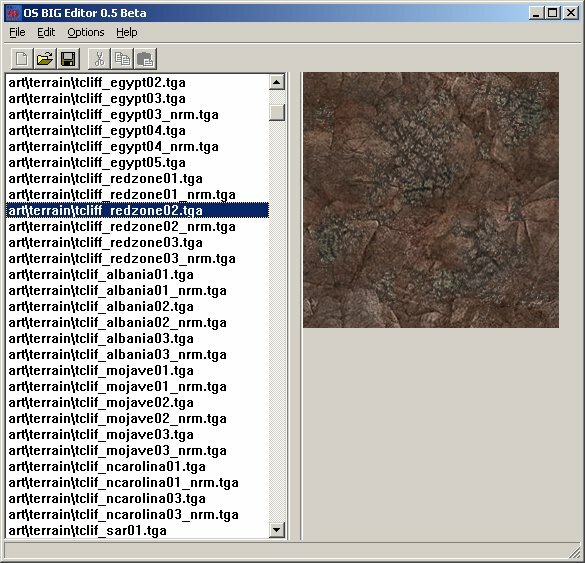 This version has a lot of new features, saving .BIG files with and without refpack, loads and saves .MEG files (for EAW and UAW), display files organized by directories, a lot of drag and drop support with windows explorer, it previews a lot of files including binaries and more image file types, you can add, rename files and folders, etc. It's definitely an editor, but somethings are kinda bugged. I've also added a button for donations. Every donation submited throught this button will speed up the development of the program. Donators may get priorities on getting specific features done as long as it is a viable and worth feature and I'm aware of it. To make me aware of it, use the field that should have instructions to the seller to say your nickname in the forums and the feature that you want. Also, if you wanna know if a feature is worth and viable, you can PM me first. Finally, before I get insulted, you can request features without giving a single cent and I'll probably work on them, but I'll certainly priorize the paid ones. It's been about a decade you first released this, Banshee. Is there going to be an update where I can create a BIG file that works for RA3 and C&C4, for the files at least 800 MB and above? Last time I tried your 0.58 alpha, the files I tried to add to create a BIG file doesn't work. This is one of the problems that killed my motivation to work on the OS BIG Editor. The problem is actually that 800mb or bigger files generates a huge RAM memory block (over 2gb) and, since the program is written for 32 bits, it generates an access violation. I've started coding a solution for it, but I've never finished it. It's too much complicated and boring to code. Right now I have other priorities in my life, such as my doctorate thesis, so I won't work on it in this year. But the source code is online and if anyone manages to fix it, send me the source and we can bring the solution to 0.58 Alpha. Well it was already possible to use a 4 GB RAM tool (notably the 4GB patch found here: http://www.ntcore.com/4gb_patch.php) to make all C&C Worldbuilders, C&C3/KW, RA3/Uprising and even C&C4 to use up to 4 GB of RAM. I think that OS BIG Editor's RAM limit is actually 3GB. But due to the way the refpack compression is done, the limit of the size of the file that it can generate is less than half of it. It actually uses the same thing that this tool does to do 'this kind of magic'. I wrote a class in C# (you can adapt that easily for C++) for WrathEd 2.0 which reads a refpack compressed file only using a 8 MB pre buffer and a 256KB decomressed buffer (you need only 128 KB but that and the 8 MB pre buffer gave me the best speeds without taking up much space). Everything is done in memory so there are also no slow downs from writing temp data to the disk. The code is quite lengthy as the functions for read and seek are quite big. Ah sorry I missed the point. But I don't get why its so hard for you. Just write a stream that gets the data on demand instead of pumping everything at once into memory. What made it hard is that the whole program is designed to pump everything into the memory. Changing that is the main cause of the hassle . But now I'm really in trouble with my thesis. I'll resume working on OS BIG Editor once things calm down on my side. It seems to be easy to read and understand, despite the use of goto. But you are right, goto is a faster solution in this case.